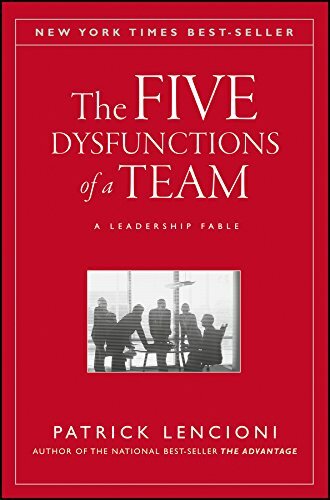 Amazon.com description: Product Description: In The Five Dysfunctions of a Team Patrick Lencioni once again offers a leadership fable that is as enthralling and instructive as his first two best-selling books, The Five Temptations of a CEO and The Four Obsessions of an Extraordinary Executive. This time, he turns his keen intellect and storytelling power to the fascinating, complex world of teams. About: Presents a workplace fable on dysfunctional teamwork, citing the fictional example of CEO Kathryn Petersen, who identifies five 'corruptions' that get in the way of her company's teamwork and how she implements action steps to overcome them. About: In The Five Dysfunctions of a Team Patrick Lencioni once again offers a leadership fable that is as enthralling and instructive as his first two best-selling books, The Five Temptations of a CEO and The Four Obsessions of an Extraordinary Executive.